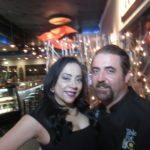 Meet Chef Adam Navidi and his partner, and better half, General Manager Barbie Wheatley. What a perfect pairing! You may recognize them from the Huntington Beach Hyatt where they both worked for many years. 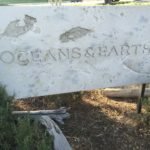 About a year ago they opened a new restaurant, Oceans & Earth, in Yorba Linda. This recent visit was not just dinner. It was so much more! It was a wonderful discovery that really elevates “FARM TO TABLE” to a whole new level. It brings it into the stratosphere. Chef Navidi is a power-house with boundless energy and passion for what he does. 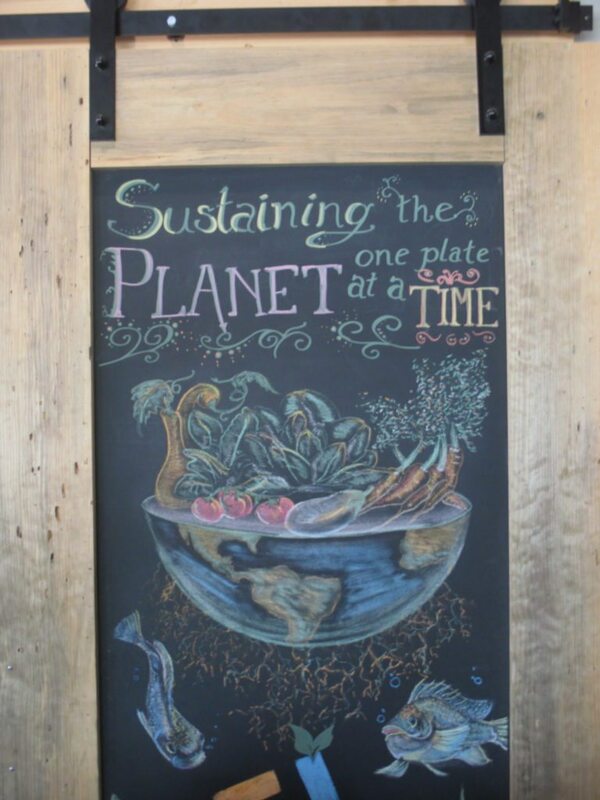 He is Executive Chef of Oceans & Earth, runs Chef Adam Navidi Catering and also operates Future Foods Farms in Brea. 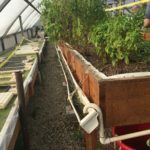 With 25 acres and lots of plans for expansion, Chef Adam and a staff of one, oversee an “aquaponic and hydroponic” farm. 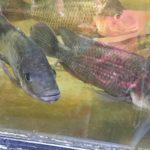 The fish and produce that is grown here is used in all of his business units and is also sold at local farmer’s markets. 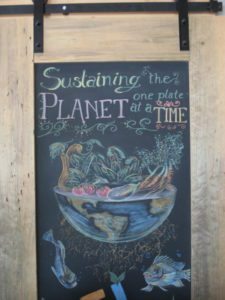 He makes me think of this quote that I really love— “The difference between thinking about it and doing it, is doing it!” More on his inspiring farm in a moment, but first let’s explore the dining experience at Oceans & Earth! 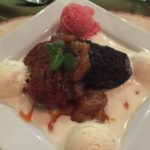 The Oceans & Earth restaurant is tucked in the corner of a shopping center, and is undeniably a “locals spot”. There is a community high-top table right up front, sheltering the fun open kitchen beyond. 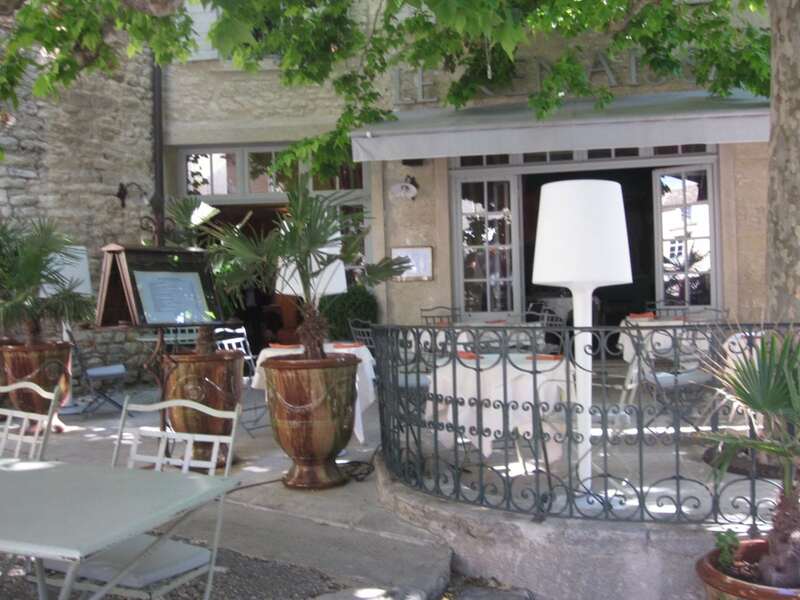 The bar is just steps away, with an “L” shaped dining room beyond. Music was playing on this evening which adds a nice touch to the ambiance, and encourages diners to stay awhile longer. There is a wrap-around outside patio that is perfect for warmer evenings coming our way very soon. The wine list is impressive and yes, I am quite partial to a California-heavy wine list. And their Wine Dinners include an “A List” of wineries, so do check their upcoming performances— I mean dinners. 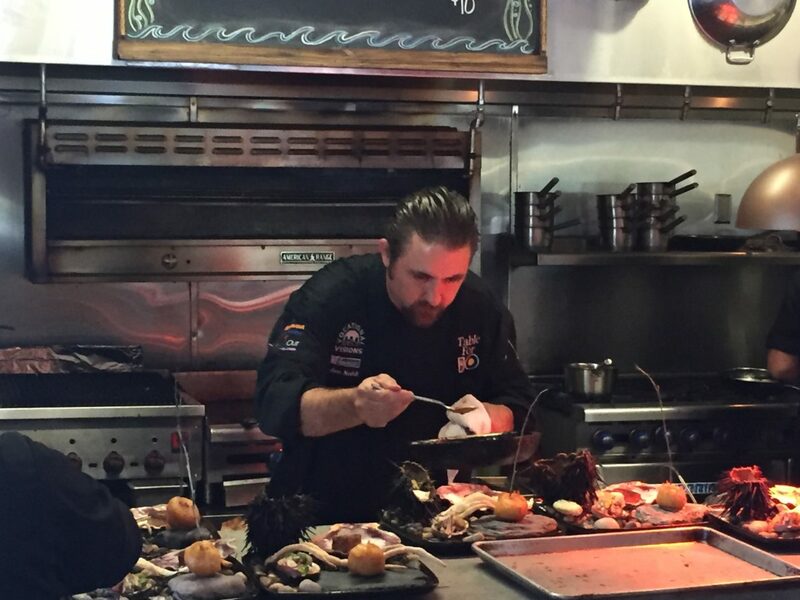 Watching Chef Adam behind the pass is like watching a conductor perfecting his arrangement. Using all of nature’s ingredients, which are seemingly at his fingertips, he assembles a delightful dish that is not only pleasing to the eye, but delicious to taste. His years of expertise shine with each brushstroke to the plate, of his colorful canvas. It is a pleasure to watch him at work, and I can almost hear the wheels turning as I watch him finesse the ingredients he so thoughtfully selects. Our staggering seven-course tasting menu was a joy to read through, and the wine pairings were sublime. Let’s take a stroll through this incredible menu, from bow to stern. The pictures will be as descriptive as the words, I am sure of that. The first course was Tasting Of Tides. This platter of the sea, was seductively displayed in four quadrants. Tilapia & Oceans Rose Abalone Ceviche, with greenhouse tomatoes and hand-picked wild clover from the farm. The Crab Croquettes with Alder Wood and Nasturtium Aioli were delicate and delicious. It was uniquely sitting atop a hot stone. The Seared Sea Scallop was served with Seaweed and an Orange-Ginger reduction, which I hope to duplicate at home. What a perfect complement to the scallop! It shined in the shell calling “pick me first”! 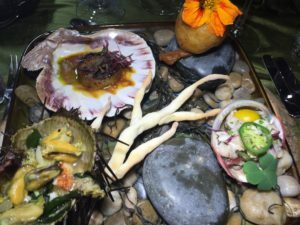 And the Tidepool Sea Urchin (spines and all) with Hope Ranch Mussels and Lobster were swimming in a Mugwort (an aromatic herb) Stock, and accented with seaweed, the herb Stinging Nettle, and house gluten-free Brioche. This was paired with Decoy Sauvignon Blanc-Sonoma County 2014. The second course was Future Foods Farm Salad in Backyard Grapefruit. 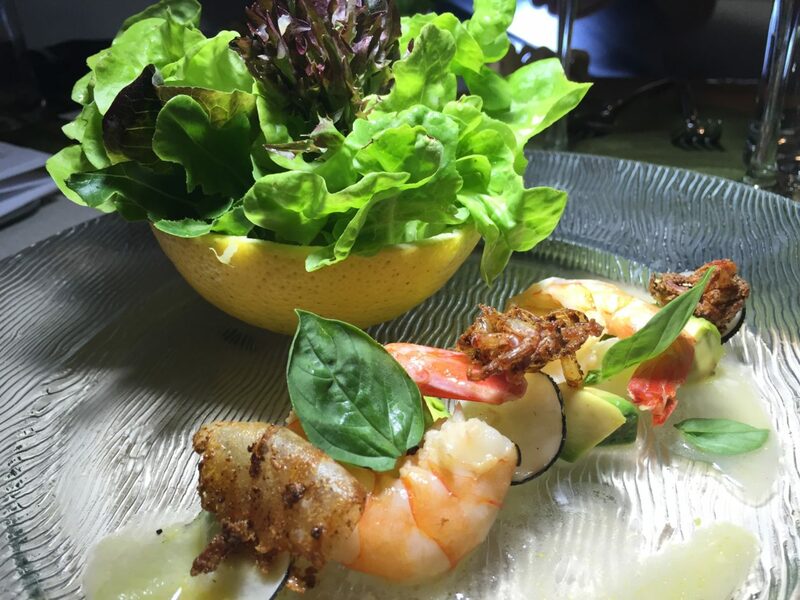 The baby butter lettuce, was complemented by the Avocado, Saffron Shrimp, and Shrimp Chicharron (a popular snack in Peru and offered a nice crunchy texture. This was paired with a crisp and delicious Cakebread Chardonnay- 2013. One of my favorites. 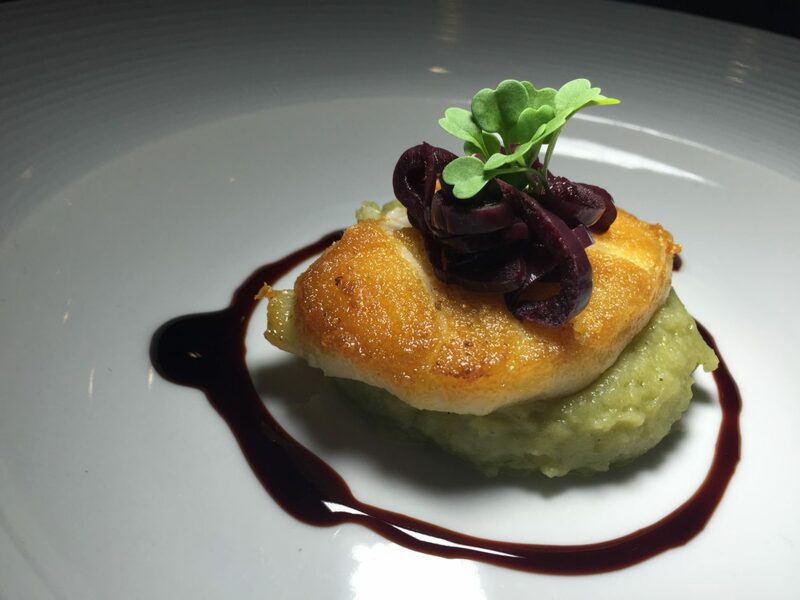 The third course was a delicious Pan-Seared Chilean Sea Bass. 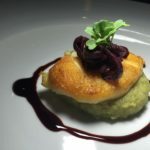 This was pan seared to a light brown perfection and sat atop a creamy Greenhouse Basil Mashed Potatoes, Caramelized Shallots, and a Red Wine Reduction. This was a standout and was paired with a 2012 Robert Sinskey Pinot Noir. The wine stood up perfectly balanced with this delicate white fish. The fourth course was Duck Over Wild Mustard Fields. This was creatively plated with duck fashioned in many different ways. The duck leg and breast were served confit alongside duck pate and a fig glaze. 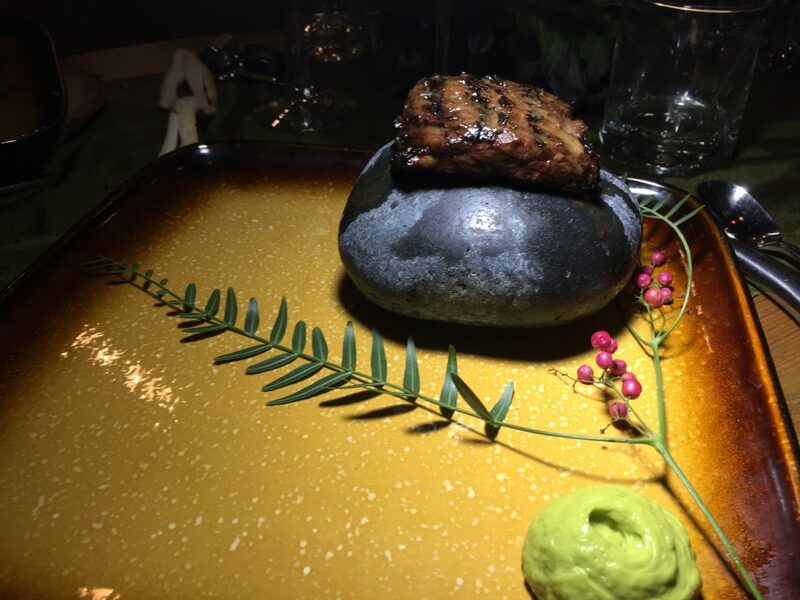 A swoosh of green danced on the plate. The crispy duck was so perfectly prepared. This was paired with another one of my favorites… a Justin Cabernet Sauvignon. The fifth course was a fun take on a burger. Leave it to Chef Adam to re-invent the classic burger with a meatball of sorts. He takes all our favorite ingredients in a burger and mashes it together. 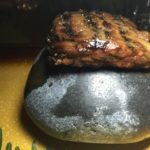 Meet the Evolution Burger. 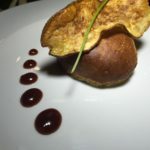 This is grass-fed beef, mixed with an aged cheddar cheese, tomato, onion, and lettuce, all rolled into a ball, and presto—-wrapped in a gluten-free pastry bread, or dough of sorts. It is utterly delicious and fun to eat. And did I mention the barbecue truffle sauce? Amazing. This was served with a 2012 Stags’ Leap Petite Sirah. 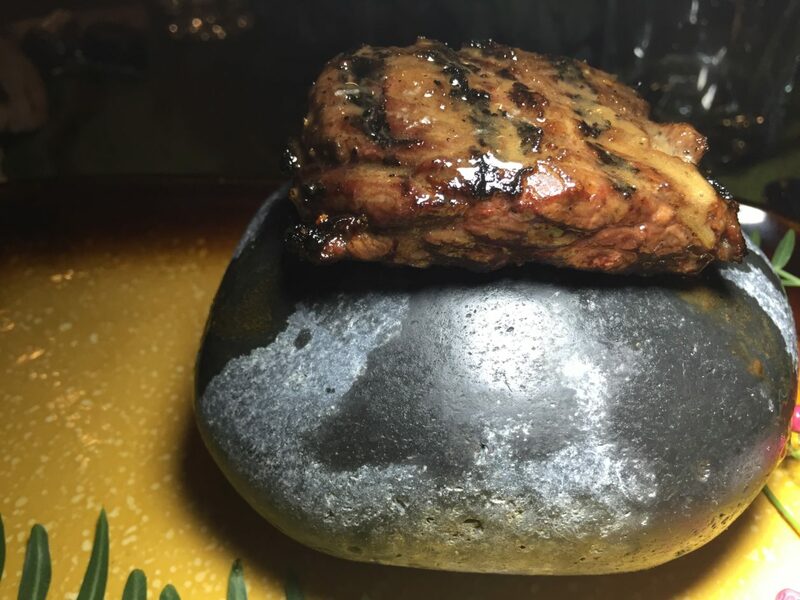 The sixth course was another playful and creative presentation called Hot Rock Steak. 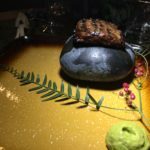 Imagine a Ron Burgundy Marinated Skirt Steak bursting with flavor and was resting atop a hot rock with an avocado chimichurri that so delicious I almost swathed my finger across the entire plate. This was served with a lovely 2012 Chateau Montelena Zinfandel. What an honor to be enjoying this wine, and so perfect with steak. The final course was of course dessert, and aptly named… My Love For Madelienes. 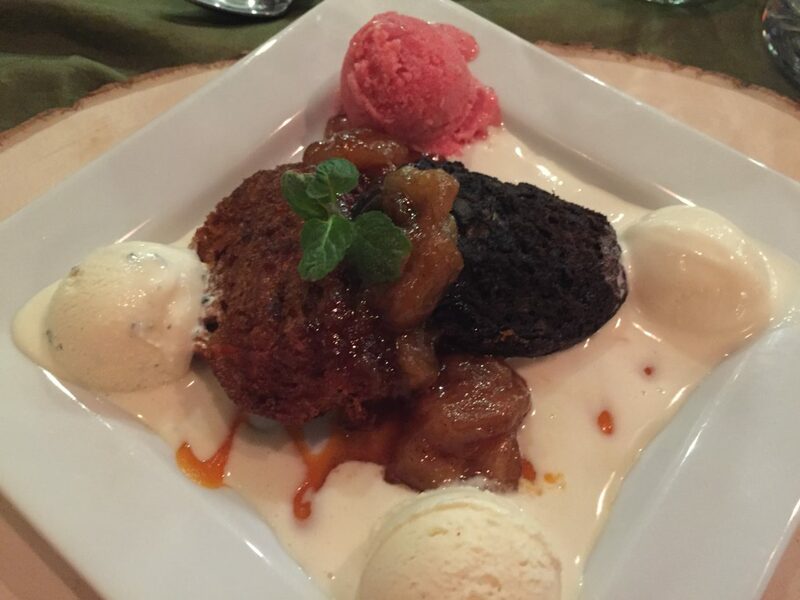 This handmade dessert was light and gluten-free madelienes that were complemented by home-churned cardamon, rosemary and strawberry ice creams. 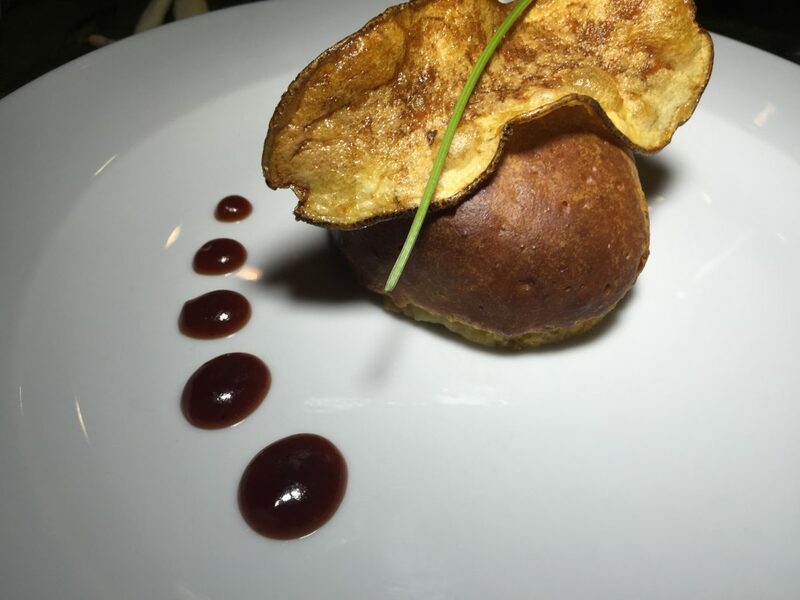 This was served with a 20 year old Tawny Porto Kopke which was the absolute perfect finale to this incredible dining experience. For me, a wonderful way to first experience a new restaurant is to pop in and enjoy an early Happy Hour. 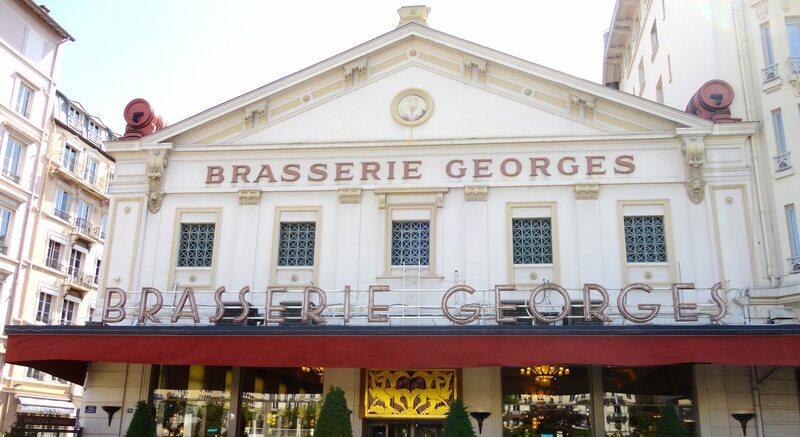 Order a few nibbles, and get a sense of the restaurant. This spot has a wonderful offering. It is available from 4 – 6pm M-F, and 9 – 11pm Friday & Saturday (at the Bar and on the Patio). 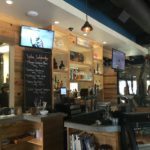 In addition to six wine and six beer selections, they include well drinks, and some welcomed “while drinking” appetizers including: Onion Rings, Cauliflower Ceviche, Ocean Chips, Tuna Poke, Flatbreads, and so on. The Thai Chicken Salad really had my attention when I walked in the door. I must say the menu is a plentiful selection of choices. If you cannot find anything here, you best go straight home and repent. There are 11 different small plates that are so fun for sharing. They had me at Flatbreads and there are 3 from which to choose. The Salad selection is one of the most diverse I have ever seen (and that is a lot)! 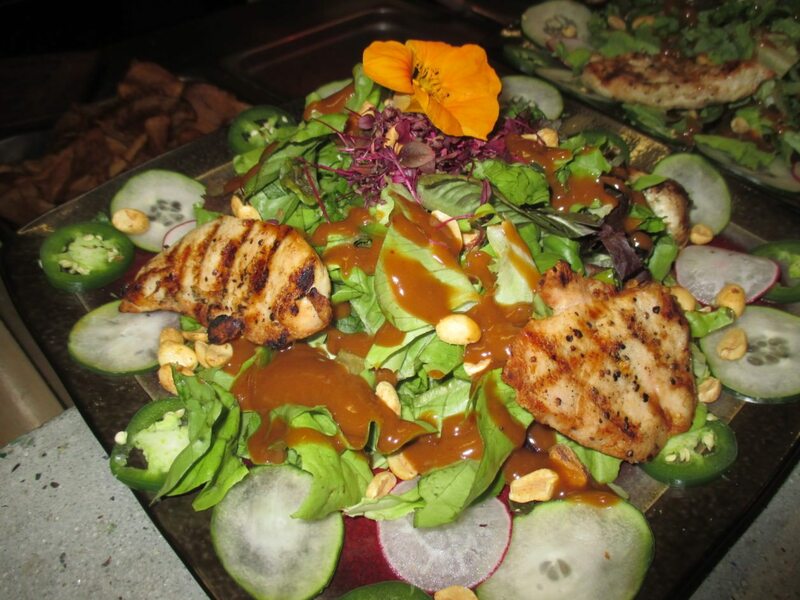 There are 8 different complex salads—from Thai Chicken to Crab Louie and a BLT Wedge Salad. Knowing that all six of their dressings are house made is such a bonus. 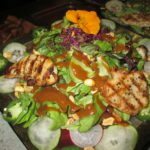 Here is the run down….Point Reyes Blue Cheese, Sesame Citrus Ginger, Thai Peanut, Local Berry Balsamic, Farm Herb vinaigrette, and Fresh Lemon & Extra Virgin Olive Oil. Who does that, but makes such a difference. By now I am reading the menu like a new novel. 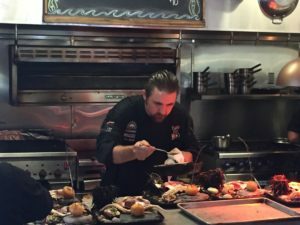 There are also six sammies and burgers, ten different entrees from Seafood Bouillabaisse, to Grilled Rib Eye and Farmhouse Chicken. There are seven different sides and of course six desserts for a staggering finale. Boom! 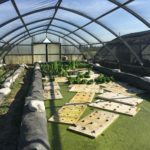 Future Foods Farms is an organic aquaponics and hydroponic farm that comprises a vast 25 acres of farmland, a fish farm and numerous greenhouses for produce and fruits. 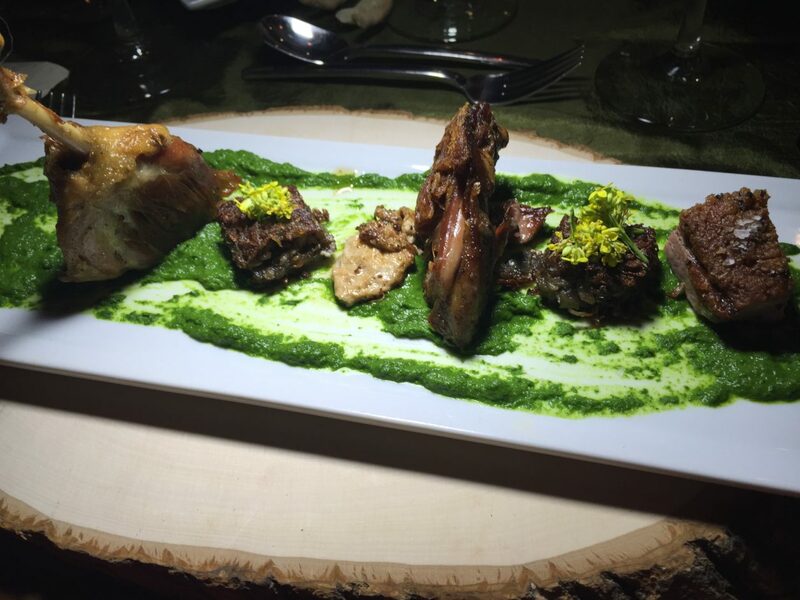 Lucky for Farmer and Chef Adam Navidi it is only ten minutes from his restaurant. 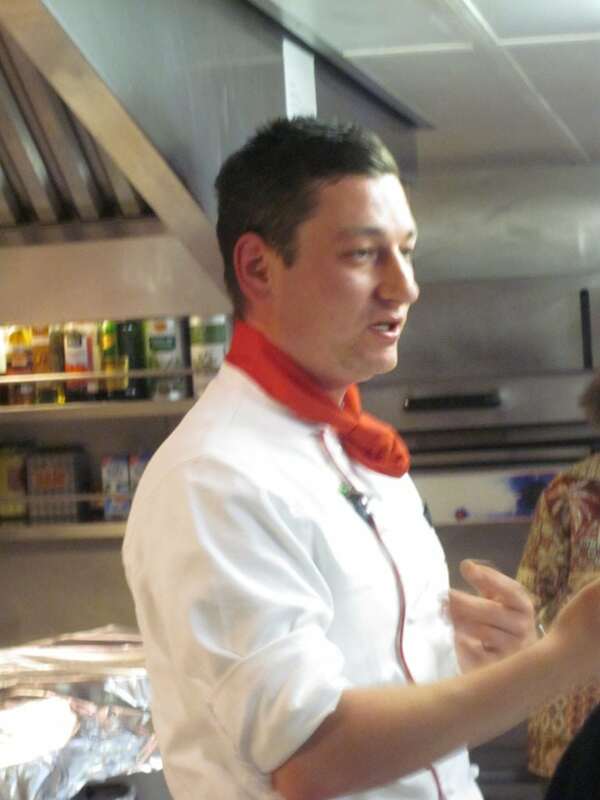 Navidi, like many chefs, was influenced heavily by his mentor, the late legendary chef Jean-Louis Palladin. “Palladin said chefs would be known for their relationships with farmers,” Navidi has noted. He still remembers those words, and now as a farmer himself. 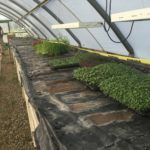 He also supplies produce and other ingredients to a variety of clients, local farmers markets, as well as his own restaurant and catering company. 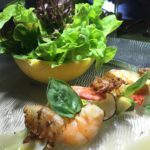 Navidi’s journey toward aquaponics began when he was at the pinnacle of his catering business, serving multi-course meals to discerning diners in Orange County. They wanted the best, just as he did. So after experimenting with growing lettuce in his backyard, he ventured into hydroponics. Later, he learned about aquaponics. 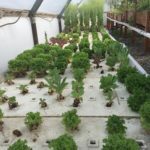 Now, aquaponics is one of the primary ways Navidi grows his food. At first I didn’t make the connection. We arrived at Adam’s farm and I could see the greenhouses in the distance, but we were led into a building housing numerous aquariums of fish. From little baby size fish, all the way up to full-grown Talapia. They were kissing up to me through the glass. I had no idea of how this related to lettuce, but boy did I learn a thing or two. Let me provide a quick “cheat sheet”. 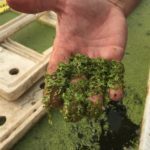 Aquaponics helps farmers in cold-weather climates grow their produce year-round, the reverse is true for growers in arid, hot and drought-prone Southern California. “Nobody grows lettuce in the summer when it’s 110 degrees,” Navidi says. But thanks to aquaponics, Navidi does. 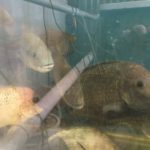 Aquaponics recirculates aquatic environment to nitrification which then helps the plants to grow. It’s the circle of life—if you will. 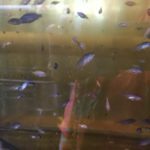 So stay with me here—there is a fish tank, and the gravel at the bottom is home to nitrifying bacteria that converts ammonia to nitrite and then to nitrate, which is used by the plants. A water pump is used to pump water from the fish tank, to the grow beds and that is re-circulated back to the fish tank. 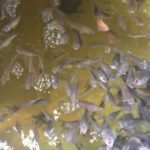 In an aquaponics system the fish provide the nutrients the plants need, and the plants purify the water by consuming those nutrients as it is cycled back. 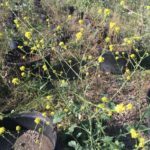 Navidi also puts other growing methods to use at Future Foods Farms. He grows San Marzano tomatoes in a greenhouse bed containing volcanic rock (this premier variety was first grown in volcanic soil near Mount Vesuvius in Italy). For Navidi, “nutrient density” is paramount. To this end, he takes a scientific approach in measuring the nutrition content of his produce. In the past, he and his staff used a refractometer, but now he relies on a more precise tool—a Raman spectrometer. This instrument uses a laser that interacts with molecules, identifying nutritional value on a molecular level. With a Raman spectrometer, Navidi measured the sugar content of three tomatoes—one from a grocery store, one from a high-end market, and one that he grew aquaponically. Respectively, measurements read: 2.5, 4.0 and 8.5. We so enjoyed our trek through the Farm. We did not explore all 25 acres, but we certainly did our best. 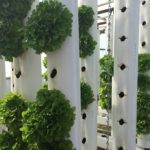 There are many methods used here at the Future Foods Farms—from vertical, to flood & drain, deep water beds (on rafts so to speak). And Chef Navidi uses all of these techniques, and more, to grow his organic produce. 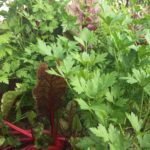 From numerous herbs to tomatoes, and up to 15,000 heads of lettuce, to wild mustard, potatoes, avocados, cucumbers, it is just an incredible plethora of produce. And across the land is another area housing flowers, fruit trees and so much more! He is an incredible inspiration. He uses the foods he grows for use in his restaurant, his catering company, and sells a great deal at local Farmer’s Markets too! He is the energizer bunny who is sharing his boundless energy, creativity and passion for a truly sustainable food system. It really is the “circle of life” to the max! O&E proudly features family owned California Winery, Trefethen Family Winery Pairing dinner. Executive Chef Adam Navidi will create a six-course organic farm to table pairing menu. Wines will include a dry Riesling, to a Chardonnay, Merlot, Cabernet Sauvignon and finish with a delicious Cab Franc. A winery representative will be their guest speaker and will guide guests through the wine tastings and Chef will introduce his menu pairings. To book your seat at this amazing dinner, call the restaurant: (714) 970-7027. Oceans & Earth 20305 Yorba Linda Blvd., Yorba Linda (714) 970-7027 www.oceansandearthrestaurant.com/ Hours: Open Monday – Thursday 4-9pm, Friday 4-11pm, Saturday 5-11pm and Sunday 5-9pm. 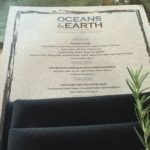 I was hosted for an intimate media dinner at Oceans & Earth, however all opinions are all mine baby!